Who doesn't enjoy gazing up at the moon from time to time? We have all stood outside on a cloudless night, and looked up to a clear sky, dotted with stars. Of course the object that stands out most is the moon. Since the dawn of man, the moon has been the centerpiece of numerous reactions and beliefs. Religions, scientific theories, superstitions, and political agendas have been derived from the moon. One thing that has fascinated us is the "shadows" that seem to fall on the moon. These shadows are assumed by most to be the earth blocking the sun's rays on the moon. In fact, this is a false assumption. We see the different stages of the moon because of the position of the Earth and the Sun. The angle from which the light hits the moon determines how we view the moon. The Earth completes one rotation every 24 hours as opposed to the moon, which takes 29.5 days. During these phases, the moon goes through a cycle that we can all watch and chart. 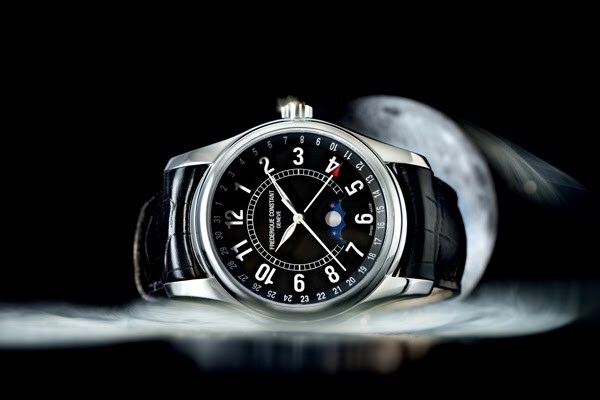 The Frederique Constant Moon Timer plays homage to the moon. The watch depicts the phases of the moon in a subtle display at 6 O'clock. Powered by the delicately decorated automatic cal. FC-330 movement beating at 28’800 Bph and exposed through a see-through case back, the Frederique Constant Moon Timer is a beautiful timepiece. The design of this classical model is ultra clean and functional. The watch is presented on a hand-sewn leather strap as well as on a sporty-elegant stainless steel bracelet. Aligned with the different available dial variations, straps come in dark brown and deep black.